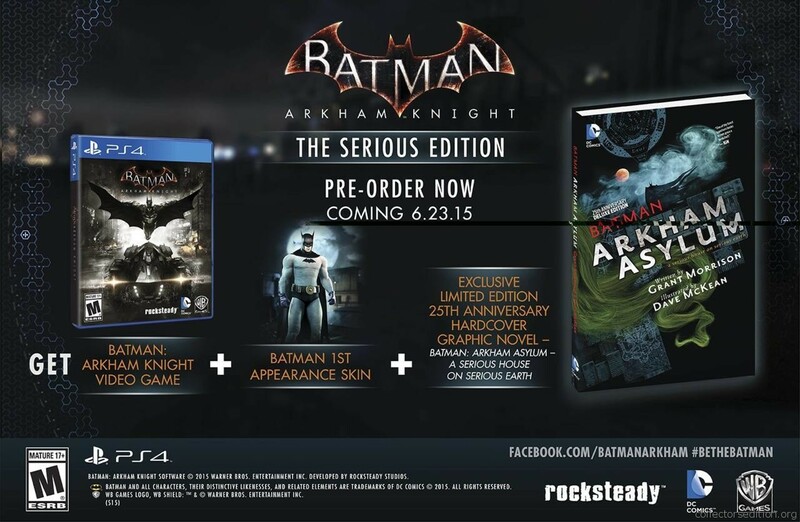 An exclusive 25th anniversary version the 1989 graphic novel Arkham Asylum: A Serious House on Serious Earth. This entry was added to the database on Wednesday, February 3rd, 2016 at 4:25 pm by THEREALDEALDUDE. This information was last updated on Thursday, May 12th, 2016 at 8:17 pm by . Come out in America eu Australia and New Zealand. Only on consoles. There will be an edition without the statue that will be on consoles and pc no PC CE for America. Limited Edition costs £89.99 / $99.99 / €119.99 on console and £74.99 / €99.99 on PC. Batmobile Edition costs £169.99 / $199.99 / €199.99. Release date June 2, 2015. Yes! I can't wait for this game. 200 euro is really expensive....it would need to be numbered for me to get it at that price. damn gonna have to spend 300 dollars! Even if it is numbered it wont be that rare it the same CE in every country. Any idea where this will be available? Looked on Amazon.com and ebgames.com.au and nothing yet. Btw UK gets it a bit rough with 170 pounds. .
Darn, ya beat me to it! 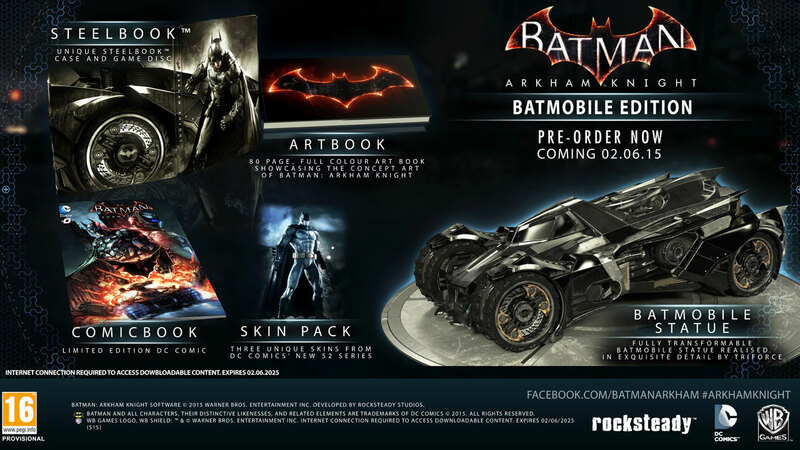 That bat mobile looks pretty awesome though AND a nice looking steelbook, somebody was paying attention to the fans! BestBuy better be carrying this soon - this is a guaranteed GCU purchase at that price! That's the "limited" edition I believe. Or at least that's what its being reported as on one of the sites. Yeah - cheapest way to do that is probably to purchase them both at BB with the GCU ($160 + $80) for $240 + tax, then sell the extra game to someone for $55 or something (save 'em $5 + tax) and you'll end up with both editions for $185 (+ tax) or so, and still have an extra artbook and steelbook to sell. Really? Do you have a source on that? The one I posted a few posts above stated that it did NOT come with the statue. Well the post i read said the batmobile edition came with everything included with the limited edition so i assumed that meant the statue as well. Otherwise its 100 more just for the batmobile statue. Hmmmmm. Both statues look equally badass tho.